It wasn’t that long ago I was enjoying my immensely powerful 7.1 surround system. Well I could, I lived in a detached house with plenty of room. Now though, I currently live in an apartment which I love, however sharing a block with 5 other people means I have to consider the neighbours and there simply isn’t the room to accommodate 7 speakers and a meaty subwoofer. So, for the last few months I have been enduring the lacklustre sound of TV speakers. As televisions become thinner and thinner, speakers have less room available and the sound quality inevitably suffers. Soundbars have become an option for those who are looking for a speaker system that takes little room, yet still offers superior sound compared to those tiny built-in speakers found on most HDTVs. Although designed for 40″ televisions, in truth the Samsung soundbar is compatible with many more sizes – it is just that the width of the actual soundbar closely matches 40″ HDTVs and so probably looks best in this scenario. It is let down visually by its own display, that unfortunately presents constantly the input you have selected. In my case, I use the digital audio input, so I was left with ‘D. IN’ unattractively revealed below my TV screen. It is a little distracting and I really don’t see the need for it either, but you certainly aren’t left with any confusion to which input you are currently using that is for sure. The display also details any adjustments you make to settings and although a little clumsy and slow, it is fairly straightforward to use with toggles rather than menus as you gradually step through each feature’s selections. While the soundbar itself provides the increased stereo separation, it is the subwoofer that is key to the performance of the whole unit. HDTVs just don’t have the room to house a subwoofer, with its much larger speaker requirement to hit those real deep rumbles and sounds and even the soundbar requires a subwoofer to fill in this part of the range. The included subwoofer plugs into the back of the soundbar by a cable and ensures you experience a whole new presence in your television entertainment. No matter whether you are listening to music, watching a film or playing a games console – the subwoofer is key to filling in parts of the audio information you might otherwise miss by just using your TV’s own speakers. One example that immediately stuck out to me was playing FIFA 14 on the Xbox One, where passing the ball hardly made a sound before, however with the Samsung HW-F350 Soundbar and subwoofer I could clearly hear the slight thud noise that before was almost completely absent. Such a small thing really, but it added so much to the overall presentation. It is these once missing details that shocked me the most that could be heard through the soundbar and the included subwoofer. Not only was I experiencing a far richer audio quality by using the Samsung HW-F350, but I could hear far more of the original audio sounds and effects that are fundamentally what makes a music track, film soundtrack or game more punchy and indeed more enjoyable. Dialogue is far clearer than before and the stereo separation allows you to further appreciate the audio within action sequences as sounds emanate from the left and right channels. It certainly isn’t on par with surround sound, however it is not meant to be at this price range. Movies, music and games take on a whole new life of their own – feeling more alive and making more of an impact on your experience, especially compared to standard TV speakers which just can’t compete on any meaningful level. Volume reaches suitably loud levels if required, highs are clear and the lows thanks to the subwoofer make an impressive impact without going over the top. Sadly the Samsung HW-F350 doesn’t come with a digital audio cable, just a classic 3.5mm to twin phono to plug into your television. These are fairly inexpensive and if your HDTV supports this, I would certainly recommend you invest in a digital audio cable which the soundbar supports and so do many modern HDTVs. You can also plug in a USB memory stick with a selection of music on that will play directly through the soundbar. The range of supported formats are impressive, including *.wav, *.mp3, *.aac, *.wma, *.ogg and even *.flac files. There are a few so called sound enhancements you can apply if you so wish. These include ‘3D Sound Plus’, a few presets that are designed to give the illusion that the sound is spreading out from the speaker rather than just straight ahead. They did absolutely nothing for me in terms of audio satisfaction, instead adding a very falsified effect that took away from the overall detail rather than increasing its enjoyment. Thankfully, the remote control isn’t one of those super thin types that is easily lost. It isn’t the prettiest thing, however is functional with an array of buttons to control the various features of the soundbar. With a Samsung TV connected, you can also operate a few of its features too with the remote. There are a few controls on the soundbar itself to adjust the volume, alter the input in use and to turn the device on and off – however, for total control the remote is by far the way to go as it includes all of the adjustments and options you need to get the most out of the soundbar. For example, if you are worried about disturbing the neighbours, the subwoofer volume can be adjusted independently of the master volume. Compared to the built-in speakers within modern televisions – the Samsung HW-F350 soundbar is an absolute joy to the ears, featuring defined bass and clear stereo separation. Once hearing the difference when using a soundbar, it is incredibly difficult to go back to the often tinny and lacklustre audio quality of the minuscule speakers housed within any HDTV. 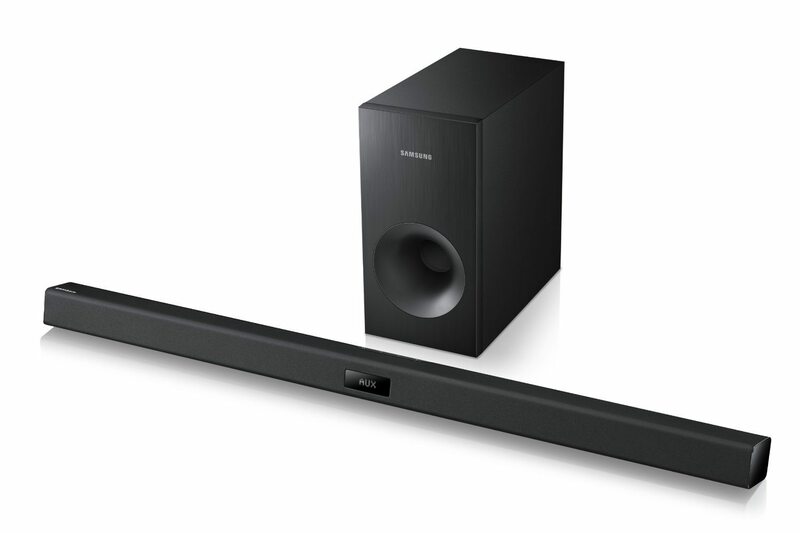 When lack of room, consideration of neighbours and the need to keep a minimal look to a room without it being littered with speakers all around are factors – a soundbar such as the Samsung HW-F350 is an option that shouldn’t be ignored. It has transformed my television viewing experience and no doubt it will yours too.